Deveneys of Dundrum: Father Jacque and Matilda. 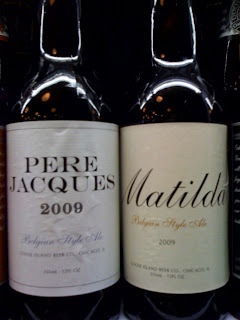 These two new editions to the Goose Island Family arrived last Friday - Pere Jacques '09 & Matilda '09, both Belgian style ales. Whether they're fact or fiction, I say good job Greg, keep up the good work and Never let the truth stand in the way of a good story. So... get in and try the good stuff with the great stories. Labels: Father Jack and Matilda. Just finished a Jacque and all I can say is wow! Colour me impressed! How do I sign up for that mailing list? Hi Chris, I'm havin a bit of difficulty with my mailing list at the moment. You can sign up to this blog and follow it, The tastings generally lands on the 3rd Thursday of every month. I'll be working on my mailing list today - if I can get it fixed I'll add you in.